Hideki Ogawa was born in Tokyo, Japan, on January 23, 1907. His grandfather began acquainting the child with both Chinese and Japanese classical literature before he entered primary school in Kyoto. While still in middle school, Ogawa found Laotse and Chuangtse, early writers and interpreters of the Chinese religion Taoism, especially pleasing because their thinking centered on nature, not the social behaviors emphasized by Confucius. 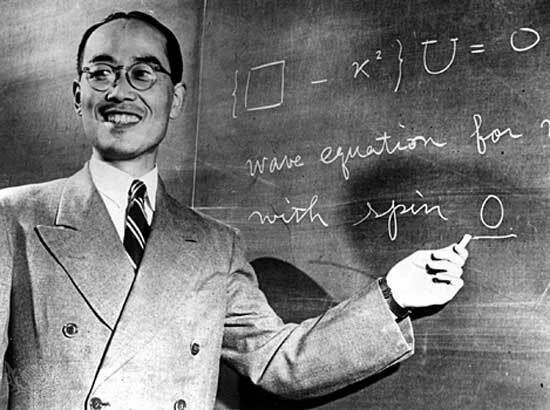 Ogawa was studying physics at the University of Kyoto (1926­29) when Erwin Schrödinger introduced wave mechanics, creating a sensation among scientists. The continuity of nature that unified wave theory implied appealed to Ogawa and he read everything available on the subject. In 1932 Ogawa married Sumi Yukawa. Following Japanese tradition, he was adopted by her family and changed his surname. That same year Hideki Yukawa became a lecturer at Osaka University while he worked toward the doctorate awarded him in 1938. He then accepted a professorship at Kyoto University. Yukawa proposed a new theory of nuclear forces in 1935 during a period of controversy about the nature of atomic particles. JAMES CHADWICK had discovered neutrons, so named because they are neutral in electrical charge, in 1932. However, Yukawa pointed out that if the nucleus contains only neutrons and positively charged protons, identified and described by scientists in 1920, the protons, all of the same positive charge, should repel each other and not hold together in the nucleus as they do. The Japanese student struggled for more than two years to explain the nature of nuclear forces and why the nucleus held together as it did. His conception of a nuclear force field suggested that there must be an intermediate ­sized “exchange” particle between protons and neutrons for the nucleus to exist. Yukawa calculated that such a particle would have a mass about 200 times greater than that of an electron, the same negative charge as an electron, and be radioactive with a very short half­life. He predicted that such a particle, called a meson, could be found in cosmic rays. In 1936 Carl Anderson discovered in cosmic rays the mu­meson, which possesses some properties of Yukawa’s meson. By 1947 Yukawa had developed a two meson model to accommodate this new experimental data to his theory. Cecil Powell then discovered the pi­meson, which fulfilled all the requirements Yukawa described for his imagined particles. Yukawa was awarded the Nobel Prize for Physics in 1949 for this work, the first Japanese scientist to be so honored. Yukawa wrote several essays and books on creativity, intuition, and cultural influences on thinking. He contended that the tension between Eastern and Western cultures stimulated his thinking in ways a more traditional acceptance of one culture would not. Yukawa worked at the Institute for Advanced Study in Princeton, New Jersey, in 1948 and taught at Columbia University from 1949 to 1953 before returning to Kyoto to direct the new Research Institute of Fundamental Physics. He also founded an international journal in 1946 called Progress of Theoretical Physics, published in several European languages. Yukawa was its editor until he died in Kyoto on September 8, 1981. Yukawa’s meson theory; while later refined, provided a bold new way of thinking about questions concerning elemental forces in the nucleus. Yukawa’s prediction of the existence of the meson prompted a wave of discoveries in nuclear physics. In 1947 British physicists Clifford Butler and George Rochester discovered a new type of particle that was lighter than a proton but heavier than the meson particles previously identified. These particles behaved strangely in relation to nuclear matter and, in fact, were referred to as “strange particles.” Four types of strange particles were identified by 1953. American physicist MURRAY GELL­MANN and Japanese physicist Nishijima Kazuhiko independently proposed a new theory of conservation to help understand the behavior of these various new subatomic entities. In 1964 Gell­Mann and American scientist George Zweig independently suggested that these elements were composed of tinier building blocks that GellMann later termed quarks, the word still used today. Yukawa helped to influence the direction of contemporary physics in other ways. He taught and encouraged young Japanese collaborators at Osaka University (notably Mituo Taketani, Shoichi Salzata, and Minoru Kobayashi) who later helped him formulate the two­ meson theory. He also fostered global communication among theoreticians with his new journal. As the first Japanese scientist to win a Nobel Prize, Yukawa became an inspiration for non ­Western people and a spokesperson for the value of Eastern ways of thinking in science. His writing on Eastern and Western approaches toward scientific investigation are provocative and pertinent today.